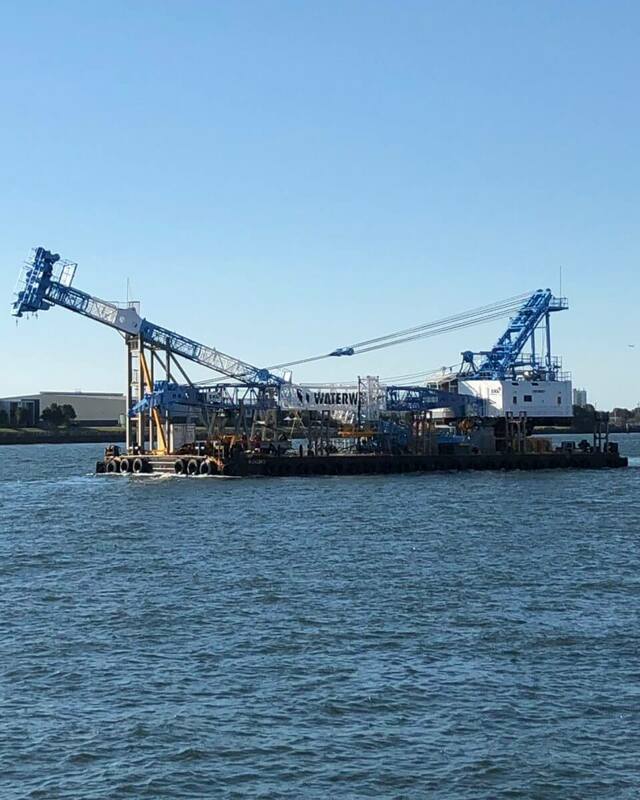 After many months of planning, the piling barge that will be a fixture along the Brisbane River for the next few months has arrived from Sydney. Currently docked at Murarrie, when the barge named ‘kochi’ arrives onsite along the section of waterfront to be upgraded, it will drive the piles for the 450m scenic pedestrian Mangrove Walk that will complement the bikeway upgrade. The piling is the first step in construction of the Mangrove Walk, which will take around 12 months to complete. Multiplex together with Destination Brisbane Consortium is currently working through the final compliance and approval requirements and will soon begin piling in the Brisbane River. While the approvals and compliance documentation for the piling is being finalised, the Multiplex team has been procuring materials ready for work. The first delivery of 900 mm diameter steel piles has arrived, and the concrete girder precast yard has been established in Beaudesert. Foreshore South activities started this month with the temporary closure of the Bicentennial Bikeway and the establishment of site facilities. Construction site facilities have now been established at two locations; The Goodwill Extension, adjacent to the Goodwill Bridge, and Waterline Park, behind 1 William Street. 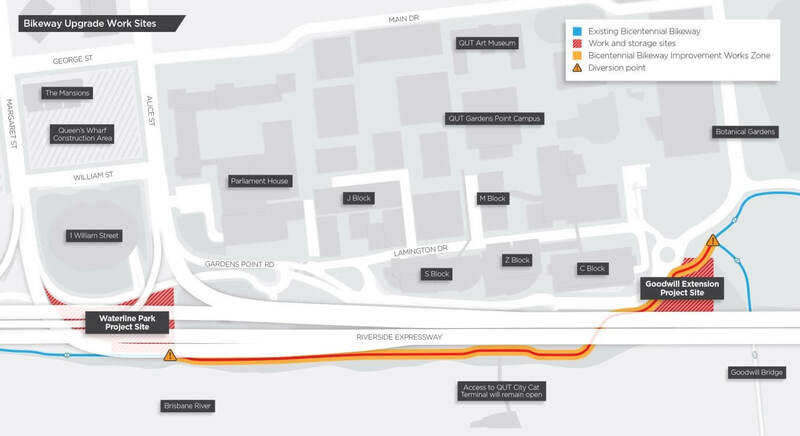 While work is underway a diversion along Gardens Point Rd and the adjacent footpath has been implemented (click here for diversion map). The Foreshore South project will deliver the first stage of public space upgrades including widening of the bikeway to a 3-metre segregated cyclist pathway and a 2-metre pedestrian path that will run continuously from the Goodwill Bridge to behind 1 William Street. This will be complimented by a Mangrove Walk that will meander along the river’s edge, and Waterline Park located behind 1 William Street.